Life, circumstances, and the lessons learned from them inform most every artist�s music and lyrics. San Diego singer songwriter Greg Newman is no exception. He�s been and seen many things in his short life: child in a struggling family, teenage petty thief and shoplifter, dishwasher, music theory student, caterer and entrepreneur, and during all of these, an aspiring songwriter and singer. All these positions and circumstances are woven together by a common thread of autonomous ambition to rise above the world that appears to have so wickedly worked against him. However, the questions remains, has this life borne inspiration or arrogance in Newman�s music. Without doubt, Mr. Newman is an impressive and inspired composer. The songs are well developed and arranged; he obviously spent many late night hours honing each piece to his perfection. The production and mix is top notch for an Indie work: clear, crisp, and inviting. The overarching style of The Cuts You Said Were Good is pure Indie melodic rock with a strong measure of diversity. Face First and Apartment are lively power pop tunes. Then Skinniest People or It�s Not Getting Better may remind some of REM type alt rock. Melancholy reigns in Someone Taking and Everybody�s Gone, with its violin preface. Newman deftly handles guitar, piano, and keyboards throughout The Cuts You Said Were Good. Yet, Newman also depends on studio musicians to fill out his sound. Here is the first place where you see his pride raise its ugly head. Newman admits turning his autonomy into dictatorship by hiring and directing, rather than working with, other musicians to complete this work. This is hardly a reputation to establish so early in a career. Ultimately, however, the strength of this album is Newman�s delightful vocal arrangements. Alone, his voice is distinctive with a natural vibrato and his performance never feels forced or contrived. Mr. Newman claims inspiration from the likes of Leonard Cohen (some mighty shoes to fill), and you can hear it on Someone Taking or Made in Spain. Lyrically, The Cuts You Said Were Good proved to be a greater challenge. Many songs have that double entendre mysteriousness that we expect from our singer-songwriters. Mr. Newman moves smoothly between creative poetic enigma and simply being obtuse. However, I could not help feeling that there was a disturbing arrogance within. Newman appears to be looking down on his subjects and their misfortunes as he writes with an obvious superior and sardonic tone. Apartment Walls, Life On a String, and Die Incomplete smack of ungrateful class superiority, and Skinniest People may reveal an aura of veiled racism. Even if I�m reading too much into these observations, the feelings were still troubling. Even with these reservations, The Cuts You Said Were Good reveals Greg Newman to be a song composer of immense ingenuity, skill and promise. 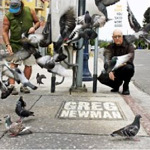 Awash in ingenuity and attitude, Greg Newman�s The Cuts You Said Were Good reveals impressive musical talent and song composition supporting sometimes provocative and disturbing lyrics.